You are here: Home / Featured Posts / The Dog Days of Summer. 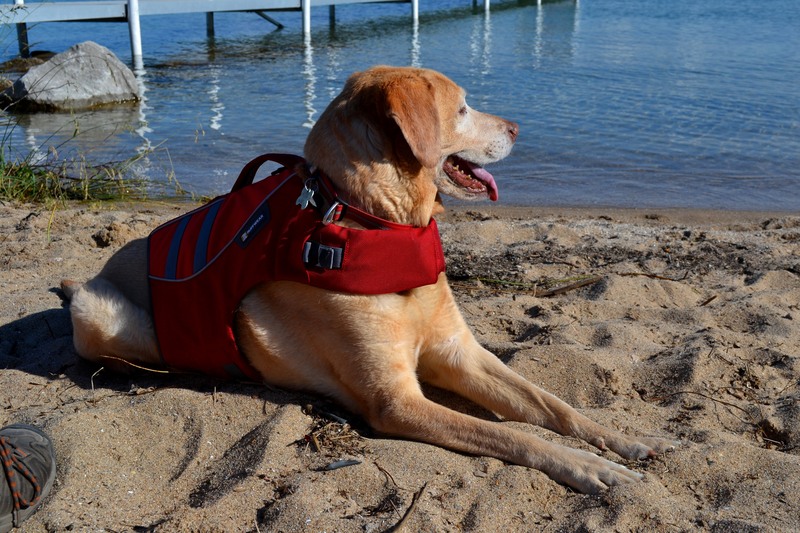 Tips for keeping your Outdoors K9 cool. Summer is my favorite time of year in Northern Michigan. My family enjoys spending as much time outdoors as possible soaking up the warm sunshine that can be quite scarce during the winter months. As with any time spent outdoors you should always be prepared and keep safety in mind for yourself as well as your outdoors K9. Even in Northern Michigan the summer heat can rapidly climb raising concerns for heat related illness or in extreme cases a life threatening emergency. Your best defense is prevention. Don’t over-exercise them and keep them indoors when it is extremely hot. Never leave your pup alone in a hot parked car. When temps are high, don’t let your pup linger on hot asphalt. Limit walks and hikes to early morning or late in the evening when temps are not as hot. Bring your pup indoors to lie on the tiled floor in your bathroom or laundry area. The cool tile on their belly will bring down their body temperature.. If you don’t have tiled flooring, soak a towel in cold water, wring it out and spread on the floor for your pup to lay on. 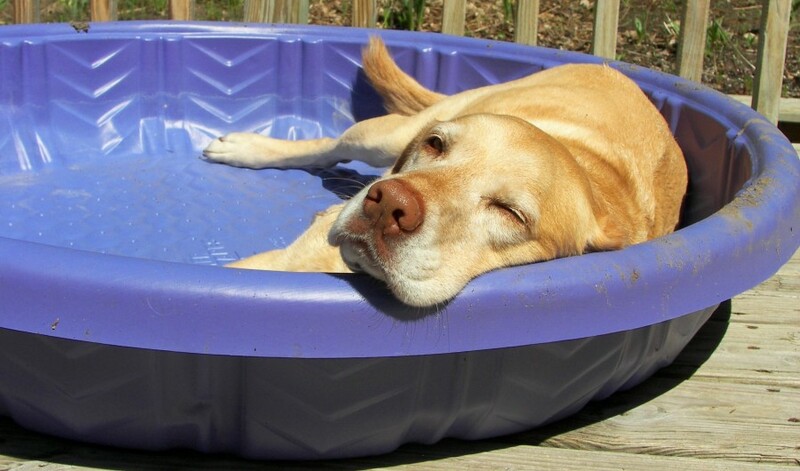 Fill up a kiddie pool or set up a sprinkler for your pup to play in and cool down. Dehydration is serious business for humans as wells as our pets. Your pup will get thirsty, just as fast as you do! Offer plenty of fresh clean water at all times. Refresh often! 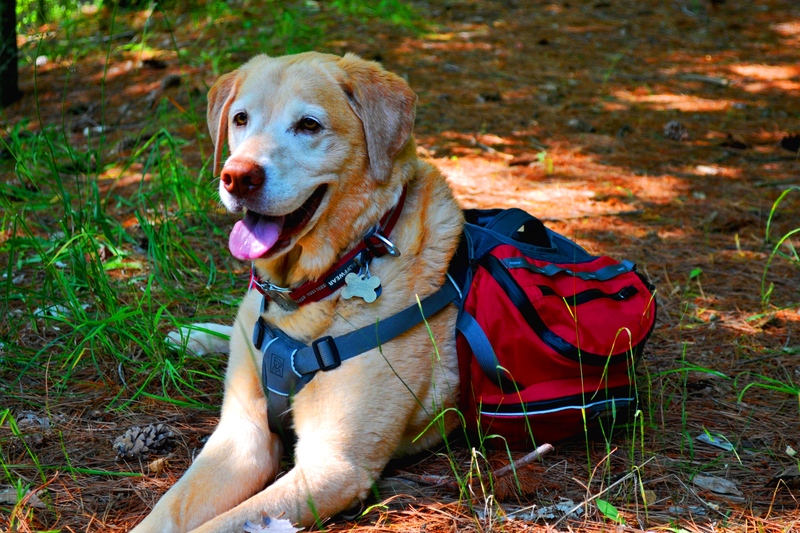 If camping or hiking with your pet, consider a collapsible bowl and a hydration backpack to keep fresh water on hand in case it is not readily available in the outdoors. Provide shade and shelter for your pet to get out of the sun. If out in the woods or on the trails, take extra breaks in a cool shady spot under a tree, better yet near a water source such as a stream, river or lake. Whether you are at home in your own backyard, hiking the trails, or camping, consider setting up an easy-up tent/canopy or try suspending a sail cloth or tarp to provide additional shading. Technology in outdoors gear has come a long way in our lifetime as well as gear for your Outdoors K9! 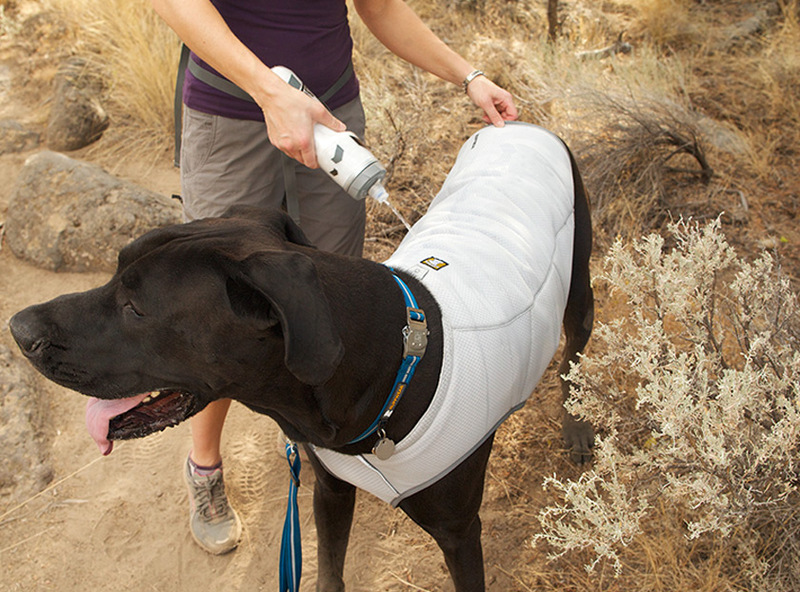 Check out these amazing products geared specifically for your outdoors K9. Just like Humans, Pets are vulnerable to sunburn too! Dark colored pups can become overheated as they absorb more of the sun’s rays than a light colored pup. Keep dark colored pups in the shade on hot days. Consider pet sunscreen for white or pale pups or pups with shaved areas or no fur protection if they have to be in the sun for extended periods of time. Don’t forget the top of their noses! The little nose tip, especially a pale-nosed pup like ours, those areas are prone to sun-induced tumors as well! Dark pink to red tongue lolling out of the mouth. Increased heart, respiratory rate, or excessive drooling. Mild weakness, sudden stupor or even collapse. Slowing down or dragging on the leash. Lifting feet to avoid hot pavement. Animals with these symptoms should see a licensed veterinarian for emergency medical treatment ASAP! As always, “Life’s An Adventure … Make It An Adventure To Remember” for you and your Outdoors K9! Do you have other great tips to help keep your Outdoors K9 safe and cool in the extreme heat? Please share in the comments section below!